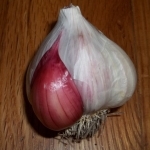 Spanish Roja is the best known and best loved hardneck garlic in America today. The large, flat bottomed, purple streaked bulbs often reach three inches in diameter and typically have eight to twelve large tan cloves. It peels easily and stores up to 4-6 months. The outer bulb wrappers are thin and flake off easily so it is not a very good storer, but no Rocambole is. This variety produces several very large cloves with each bulb. This heirloom garlic, came to the Portland, Oregon area over a hundred years ago. It is generally a vigorous grower with large foliage that is dark green and results in a pretty good sized bulb. 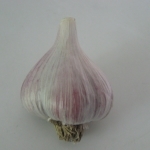 Being a Rocambole garlic, its flavor is very strong, hot and spicy and sticks around for a long time. It has the deep, rich, complex flavor of gourmet garlic at its very finest. It has been described as the most piquant garlic in the world. From a growers perspective, it grows well in cold winter areas, but does poorly in warm winter areas. The bulbs of this variety are a beautiful creamy silver and good sized. The cloves are reddish-pink. It is well adapted to climates with cold winters. If the stalks are left intact after harvest, this variety is great for braiding. This silverskin garlic type is mild and sweet when baked. When raw, starts slowly with the heat building to very hot. This strain from South Korea produces an outstanding crop. The flavor is sweet when baked and breathtaking when eaten raw. 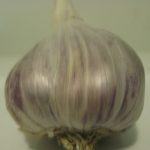 Asian Tempest is an early long storing garlic strain of the Asiatic sub-variety. It is a vigorous, broadleaf variety with a scape. The beak on the bulbil can reach 18 inches in length! The bulb and cloves are large with a blush of royal purple blush. It produces outstanding crops in both cold winter and wet, mild winter climates. Chesnok Red is from the Republic of Georgia in the former USSR. 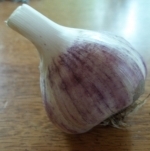 This is a standard Purple Stripe type garlic and has the typical heavy purple striping that gives this variety its name. They have about as much purple as Rocamboles but the background color of the bulb wrappers is much more whitish, making for a very attractive appearance. The cloves are milky white with cranberry-colored streaks up the outsides while the edges between the cloves are nearly solid cranberry and the elongated tips rather tannish. Purple Stripes do not store as well or as long as the softneck varieties (4-6 months) but are generally more intensively flavored and retain their flavor better when cooked. 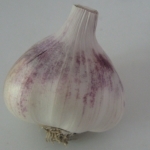 Chesnok Red is a full flavored garlic with a mellow aftertaste that sticks around nicely for a while. Especially nice choice for baking as it has a very creamy texture. They're not as large as Artichoke garlics but are larger than Silverskins (up to around 2 inches). From a grower's perspective, they seem to do fairly well in most locales. You get 9 to 10 easy to peel, large cloves per bulb. This is our earliest maturing garlic of the turban subtype. There are 9-15 large cloves arranged in two layers, which makes most of the cloves of usable size. It has white outer skins, pinkish-purple inner skins, and pink - brown clove wrappers. Chinese Pink has a nice mellow flavor that everyone can enjoy. Discovered on the Colville Indian Reservation in northern Washington. Winner of a national taste test. 9-20 cloves. This garlic boasts large heads and individual cloves. The purple streaked bulbs reach three inches in diameter and typically have eight to twelve large, tan cloves. It peels easily and stores up to 4-6 months. It is a Rocambole. It is generally a vigorous grower with large foliage that is dark green and results in a pretty good sized bulb. 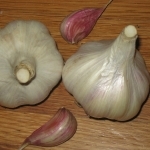 Being a Rocambole garlic, its flavor is very strong, hot, and spicy and sticks around for a long time. It has the deep, rich, complex flavor of gourmet garlic. From a grower's perspective, it rows well in cold winter areas, but does poorly in warm winter areas. This early garlic of the Asiatic subtype has a full flavor, with an extra hot initial burst. It is a long storing, vigorous broadleaf variety with a scape. This porcelain variety from Romania grows 20 inches tall and produces 4 to 5 beautifully streaked cloves per head which are very easy to peel. It has a wonderfully pungent flavor with a lingering bite. This late variety is a good keeper. This variety stores better, firmer, and longer than the standard group of Purple Stripes. The bulb wrappers are thick. An outstanding strain originally secured by fishermen trading green leafy vegetables with poor peasants who grew only root crops. Subspecies Sativum. The Sicilian Artichoke is long storing, with creamy white cloves. From the grower's perspective, it is a good producer. This variety came from Spain via Nevada in the early 1990's. Ajo Rojo is a beautiful and distinctive almost red garlic. It endures early season high heat and drought better than the average garlic. Creole garlics were once called "Southern Continentals" for just this reason. 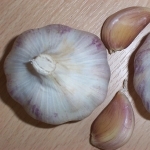 The Creole garlics are a unique group of garlics that were cultivated in Spain and spread through the Conquistadores. They have a full taste but pleasantly warm rather than hot. They retain their flavor well when cooked. They have eight to twelve cloves per bulb arranged in a circular configuration. Fat cloves and an almost satiny clove wrappers. Originally from Republic of Georgia. 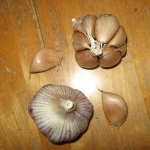 This exceptionally beautiful garlic from the Republic of Georgia has large, gorgeous purple bulbs that form six to eight beige and lavender cloves. It stores well and has a delicious earthy flavor with a welcome warmth. The bulb boasts an attractive, purplish blush. Light reddish-mahogany clove skins. Originally purchased in Bangkok market. From Salt Springs Seeds via Flora Baartz. Coming from the Transylvanian mountains of Romania, these nice size bulbs produce plump, firm cloves. Slight rosy blush on bulb wrappers. This very large and lovely artichoke softneck was discovered in a Romanian farmer's market in the mid-1990s. Big cream colored bulbs with 10-16 cloves contain an excellent flavor with more than a bit of a bite. Doesn't mind cold winters. A good keeper if well cured. A Well colored strain. From Steve Bensel of Nootka Rose Farm in Waldron, WA. Mostly 5 clove layers and 14 to 24 cloves with up to 35 cloves possible if large outer cloves subdivide. Cloves streaked red on mahogany background with solid red clove tips. Colors fade in rich soil. Medium to large bulbs and very attractive braider. Strong flavor. Nootka Rose is a magnificent old heirloom silverskin from Washington state but its origin prior to that is unclear As with many silverskins its bulb wrappers are thick and creamy white. The cloves; however, are a beautiful deep mahogony color with red streaks and almost solid red elongated tips. 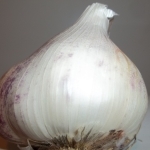 Bulbs can become large for a silverskin and contain 15 to 20 or more cloves. Clove colors can become a little more subdued when grown in rich garden-type soils. 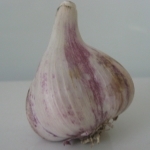 It makes an excellent braider and you can strip off the bulb wrappers down to the cloves and use its burgundy-on-rosewood appearance as an attractive table centerpiece for that special occasion.This very imperial looking garlic has a taste as bold as its looks. It has the full flavored character typical of silverskins and its parchment-like bulb wrappers are easy to peel. Because it is a long storing variety, you might want to grow some and save them for the time when your other varieties have already sprouted and are no longer in an ideal eating condition. It's worth having this one just for its decorative possibilities, even if you don't eat much garlic.